Li Zhongxuan, the author of this book, was born in Ninghe village, in the general area of Tianjin, China. He had been the student of Tang Weilu, Shang Yunxiang and Xue Dian (all three were, in turn, student of Li Cunyi). His parents came from a respectable family of government officials from the Tianjin and Beijing areas. 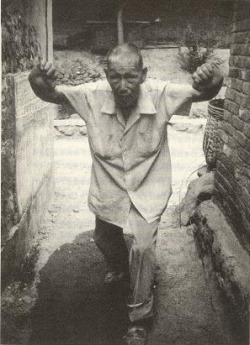 Li Zhongxuan chose to abide by an old rule in Chinese society, which forbade people from martial arts circles to serve as government officials, and had therefore given up the opportunity to be in that line of work, even though through his family connections this was relatively easy for him to achieve. At the age of 34 he withdrew from martial arts circles, but continued to train. During the later years he had worked as a guard at the entrance of an electronics store, in the Shidan area in Beijing. Because of an oath he made to one of his teachers, Shang Yunxiang, he never taught anyone his martial arts. Someone had once recommended this book to me, and I could not lay it down once I began reading it… Among the dozens of Xing Yi Quan related books written by Chinese authors thus far, this book is the only one written in first person, depicting the experiences of the author throughout life and under the tutelage of some of the greatest teachers of his era. His stories reflect the traditions and customs of his day, discuss disciple-teacher relations, and are generally fascinating and full of colourful descriptions of the Xing Yi Quan he had been taught by his teachers. The stories provide an extra dimension to the life and personalities of those people. The book was dictated to an editor in conversations with master Li, and printed without further editing – which is why the text reads like a conversation. Myself, I have translated two additional chapters back in 2006, which were further translated into English by my student, Jonathan Bluestein, under my supervision. Chronologically, the reader might be better off first reading the chapter translated by Mr. Nicklin, and then read the translations presented here. My teacher Tang Weilu liked to wear a white overcoat. One day he was wearing it while holding a bowl of noodle soup and explaining to us about the martial arts. We, his students, like to pull of acts of mischief, and at one point we ceased the opportunity and clashed into him, hoping his soup will spill on his shirt and ruin it. Without using his hands or feet, he simply turned around, and we were thrown to the floor, while the bowl stayed steady in his hand. Tang said: “In Xing Yi, that is what’s called: shoulder hits, hip hits, buttocks hit”. The way you use this sort of attack is different from issuing a punch – one little ‘rub’, and it’s over. Shaking your waist, protruding your shoulder or pushing out your buttocks look really ridiculous (are the wrong way to do it). 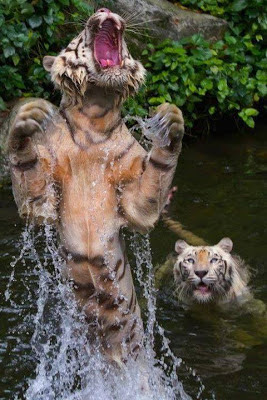 The attack should commence very close to the body, and be swift like a dragonfly touching the water. incorrect to say that our arms ‘hit’ – it’d be more accurate to say that I stroke your arm. Later, master Tang explained to his students that this torqueing is necessary to manifest not only in the arm, but with the whole body; coiling and uncoiling, to helped issue force. Releasing force in Xing Yi is not done in a straight line. Master Tang taught me the arts in the traditional way, with a lot of rules: “One must train in a yard that is surrounded by a wall, so there wouldn’t be another pair of eyes around. Additionally, one should train at night”. The reason for the latter requirement, besides secrecy, is to energize (enliven?) the spirit (Shen), which is reflected through the eyes. I thought to myself, that only the ancestral temple that was located at my mother’s house would be suitable for such requirements, and therefore I made an arrangement with master Tang that he would move in and live there. There were times in which other students came to train at the temple, so it was a very happy place. In this place, I have made a life-and-death tie with a younger gongfu brother of mine, whose name is Ding Zhitao. Because he could eat more than any other person, I nicknamed him a ‘food tank’. I do not look like a person who trains in martial arts, but he did looks quite like one – tall of stature, with raging eyes and a momentum that made people shake with fear. Through each day, from morning to evening, he could not resist his addiction of competing with other people in fighting. Yet, he was a man of good temper, and was always honest towards me. Therefore we became blood brother; I gave up other matches that were made for me, and married his younger sister instead. Unfortunately, brother Ding was inclined to extreme shifts of mood and temper, and following a disaster, he passed away. My father, a self-centered spiritual man, was fond of arranging groups of like-minded men, go with them on trips to nature, to Nanjing and to Shanghai, and once they got at their destination, they would stay for long periods of time. He spent very little time at home. One day after he returned home, my father went pale-faced after he realized that the ancestral temple was full of people. Afterwards and because of it, master Tang stopped arriving at the temple. This had caused a great split between my father and I, because I liked studying martial arts so much. There was even a period at which we two were on bad terms. Such is the temper of those who were of a higher education. At that time I could no longer stand staying in Ninghe. Master Tang believed that all the troubles were brought about by himself, and because of this decided to send me to study martial arts from Shang Yunxiang in Beijing. At least that way, he figured, I would also have a place to stay. Because the age difference between myself and master Shang was too great, he was not willing to accept me as his disciple, saying that: “An old master with a young disciple is something that would confuse the social order”. Master Tang insisted, and claimed in my favour that I was “an educated kid and a good guy”. Afterwards, he also explained my person situation. Master Shang decided that I had courage, and therefore finally decided to accept me as a disciple. We immediately arranged for a Bai Shi ceremony, at which I was sworn I would never teach anyone else. Later in life I had the opportunity to test for a governmental clerical position, but master Tang forbade me to do this, as by the ancient traditions and rules, a martial artist with a clerical job cannot be included in the social circles of martial artists. There is a saying in the martial arts folklore, which states: “He who trains in Gong does not train in Quan”. The meaning of this is that, supposedly, he who trains in Zhan Zhuang does not train in fighting. This thinking is a mistake made by beginners. Training. In Xing Yi Quan, one should train the Jing (Essence) to be transmuted into Qi, the Qi to be transformed into the Shen (Spirit), and the Shen to return to emptiness. The Qi which is inhaled and exhaled is called breath. Pi Quan exercises breath – not in terms of fighting usage, but in the way it is practiced. When one first learns Pi Quan, one should find an open and wide training space. When a man climbs a high mountain, once his field of vision opens he feels like he just has to make a long exhalation. In a spacious place it is easier to breath freely. The posture of Pi Quan is with the hand movement going forwards and back again, like the motions of inhalation and exhalation. One should practice for 400-500 meters in each direction. Breathing becomes long and prolonged, deeper, and the energy storages are refueled. The movement of the hands stimulate the whole body, and one starts to slowly feel that the breath expands, and all of the skin’s pores across the entire body open up. Xue Dian once said: “People who practice martial arts needs to learn to breath from the body”. The sophistication of breathing through the body one learns whilst practicing Pi Quan. Many people have hidden diseases, which Pi Quan practice can completely eliminate. Additionally, once one gets older, the body reaches a state wherein it lacks Qi. The practice of breathing will replenish the Qi storages. Fullness of breath and the Qi is the basis of martial arts practice, and this is the reason that Pi Quan is the first thing to be taught in Xing Yi. To begin with, Pi Quan already contains within it the posture of Zuan, and after training in Pi Quan, the learning of Zuan Quan is relatively easy. This is exactly what’s called ‘Metal giving birth to Water’ (a part of the Wu Xing theory). Pi Quan belongs to Metal, and Zuan belongs to Water. Trying to learn a brand new fist posture, like Beng, is more difficult. Pi Quan nourishes the lungs. The arms affect the lungs directly. When children go through some physical exercise, such as engaging in an action that expands the chest, stretching, etc, the movement of the arms is used to train the breath, and as a result the lungs get stronger. The legs, on the other hand, relate to the kidneys. In case someone suffers from sexual impotence, we (in Chinese Medicine) call it ‘the water in the kidneys are insufficient’. From examining the martial aspect of Zuan Quan, we may see that this fist is meant to train the elbows and finger joints. But from the health perspective, this exercise, through the training of the legs, treats the kidneys. This is why the stepping in Zuan is not directly straight, backwards and forwards, but is advancing in a spiral. By so doing it enables the legs to have an open space (between them? ), and as a result the Qi of the lungs and the water in the kidneys are sufficient. It is only when the upper and lower halves of the body synchronized that one can advance. This is why Zuan Quan is trained after Pi Quan. At the stage of training Pi Quan, everyone mat reach a state in which they feel as the skin is thick like an elephant’s. One may also feel that the fingers of the hands become thick like carrot, and as if there is a ‘vortex’ at the palms of the hands, which draws the fingers to close of themselves and ‘wish’ to remain close. All of these are false sensations. This is caused when the Qi within the body becomes satisfactory, and one’s mood is hyperactive, like a child who jumps from one thing to another and in whatever he indulges in, he has lots of interest. This is a stage that one must go through; if you discover that you have become like this, this means that your gongfu is developing in the right direction. At this point, there is no longer a need to go to a broad open space to train. In Xing Yi, ever since ancient times, it was commonly said that: “Martial training – (should be able to take place) in an area a cow can lie on”. Wherein there is a little room for stepping, that place can be practiced at. To go to broad open spaces to train is only a way to aid one to easily enter at this style’s door. Our Xing Yi Quan was passed unto us from Li Cunyi. The goal of it is to defend our country, and not to cause trouble. Master Tang said: “(When) you’re cruel, I’m afraid. (But if) You’re afraid – I am even more afraid. That is how my student should be”. Courage and talent should be used for the benefit of the country. As far as personal disputes are concerned, it is best to present oneself as lacking in ability. When training Pi Quan, one should not practice in a place that is full of people. One should not take other people’s place (Jonathan: probably refers to avoiding territorial disputes over occupying public spaces for teaching and business). If there’s trouble with people, you should not cross hands and fight. One should learn to subdue with the intellect and win with morality. One should leave time for training in the martial arts, and not get into trouble and waste time. 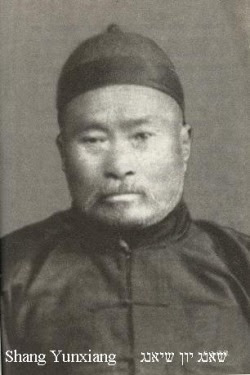 In the picture: Li Cunyi (李存义, 1847 – 1927). Because Pi Quan exercises the breath, it takes a year for this gongfu to be acquired. In the beginning, it eliminates diseases, and later it strengthens the body. Through the exercising of the breath, the Qi in the body grows, and a lot of times one would get a feeling of inspiration. At this stage, the learning of martial arts can become very interesting. The water are found at the base and flow down. Therefore, after practicing Zuan, the character becomes stable and modest, the quality of the skin improves, one’s voice turns nice to listen to, and the thoughts are cautious and attuned. In the past, my teachers were illiterate, but their character was refined and moral. Because Xing Yi is an internal martial art, it does not merely change the body of the man, but also reshapes his wills. The gong fu which in martial arts is ‘basic gong’, requires a great effort (to be attained). The most basic thing that is required to be a good human being is reliability and modesty, which in turn require restraint. “The old must be mad and the young must be stable”. The old insist upon rules and the young find them hard to follow. Therefore, the old must be optimistic and light, while the young should accept society’s rules of mannerism and politeness. It is only in this way that harmony can prevail and the transmission of knowledge can continue. Master Tang maintained the teaching of Xing Yi Quan by the ancient rules, and had persevered a few ‘acrobatic’ traditional moves. We nickname these ‘acrobatics’ because these are surprising fighting skills, such as Qin Na (Joint Locks). In the Xing Yi taught by master Tang, the application of a lock by with the palm of the hand is called a ‘small/big silk binding’. Using the whole arm to perform a lock is called ‘splitting the horse’s mane. Using the body to perform a lock is called ‘The Lazy Donkey Lays on the Road’. Using the whole body to perform a lock is a unique trait of Xing Yi Quan – of 10 lock (tries), 9 succeed. There is a common proverb which states: “A light lock does not equal a simple strike”. Meaning – it does not matter how good you are with locks – you would not be able to overcome a wild attack; but Xing Yi’s locking skills contain a knocking action within them. My gongfu brother, Ding Zhitao, is a butcher. One day master Tang took me to see him at his workplace. When brother Ding slammed a spine of a pig upon the cutting board, the spinal column softened, and the vertebrae scattered. Master Tang put his hand on my shoulder and said: “this is exactly how our Qin Na should be like”. My brother Ding is quicker than me in acquiring an understanding of the practice, so he immediately understood what master Tang has meant. I asked master Tang to explain, and he said as follows: “Gripping is dead (stiff and fixed). Knocking has aliveness. No gripping, only locking.”. Meaning – the key to the learning of Qin Na is the ability to continue to learn beyond the continuous methods (Jonathan: last sentence was a direct translation. I am not sure what he meant by this). Master Tang also demonstrated some hand techniques, and determined a rule: “Because Qin Na can cripple other people, we should not use it”. One day, a relative of mine died. After the burial ceremony was over, I took a few of my gongfu brothers to help me clean all the mess. The way in which we had done it frightened my family members. In a moment or two we were done disassembling the large flag-bearing stand. The rumor on how we did it so quickly passed through the entire area of Ninghe, until it reached master Tang. He then told us: “Did you learn Qin Na? Then, do not use it to perform any type of labour, lest it becomes a habit, and each movement could become a lock, and then you’d end up hurting your family members (accidently)”. In ancient times, many masters used to copy Confucius in accepting students. Zi Gong helped Confucius befriend the authorities, Yan Hui helped him spread knowledge, and Zi Lu helped him manage people. When there are 3 such people in a family, this can be very interesting. One could see in the Book of Analects that when people used to ask Confucius questions, he’d answer and explain patiently, but when Zi Lu would ask him something, Confucius would subdue him to the floor with a single sentence; he did this to train him to develop the ability to pursued a large audience with a single sentence, so (in the future) he could manage the rest of the students. The teacher teaches every student in a different manner, so every student could fulfill a different purpose. Confucius said: “Because Zi Lu is among my students, people do not dare say bad things of me. My gongfu brother, Ding Zhitao, fiercely defended the honour of master Tang, and had anyone been disrespectful towards him, that person would be in serious trouble. At that period of time, a group of actors had reached Ninghe. The martial artists among that group (who do tricks like) stand on table and perform somersaults to the ground. They heard that in Ninghe there was a certain ‘master Tang Weilu’, so they began saying bad things about him and praise themselves. The moment my brother Ding heard of this, he decided to go and settle the score with them by bearing them. I tried to convince him to give up on this and avoid ‘shutting their mouths’, saying that it was very hard for such people to earn their living on the street. That is why they try to sell themselves in this way. I found an old cotton jacket, tied a rope around my waist, and put on a worn-out straw hat – a dress characteristic of a beggar. I went towards the theatre, but stopped at the entrance. My family is originally from Nanzheng, and in Ninghe we were considered a respectable family. Because I arrive at the theatre often to watch shows, and am even known by the nickname ‘naïve Li’, the gatekeeper at the theatre immediately recognized me. He asked: “Why are you dressed like this today?”. I paid for the entry, entered without answering and sat in the front row. The show began, and it seemed that the actor/martial artist performing was distracted, with his gaze constantly shifting slightly in my direction. I remained sitting after the show was over. After a while the actor came from backstage. He spoke highly of master Tang, and even expressed his wish to invite him for a meal. Apparently, the gatekeeper told him I was master Tang’s student. time I had merely been a 16 year old toddler. Perhaps I wanted to solve the problem in this way because I was young. Master Tang was very displeased with my behaviour, and when the actor arrived to invite him for dinner to show respect, Tang insisted to be the one who would pay. Master Tang said that had the actors believed that I was indeed only a beggar that day, I would have paid for my actions dearly, since I only know how to train, and not how to fight. 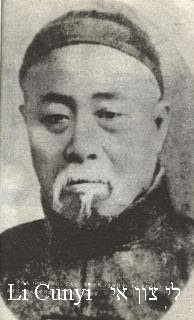 In the picture: Li Zhongxuan. The Xing Yi Quan classics state: “First, the body must not learn fighting”. 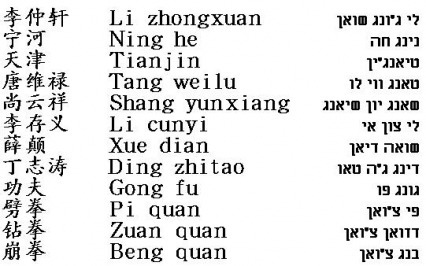 Meaning, that before fighting one should learn the skill of the body of whipping with the hand, and changing the power of the whole body; otherwise in a fight, there is only gong fu, but there is no speed, there is no crispness (Nitzan: crispness like that of a cracker snapping in two), and you will surely lose. If the gongfu is not acquired, then the self-training in fighting without the supervision of a teacher can cause a concussion and damage the joints. That is why it is said that “First, the body must not learn fighting”. Master Tang explained that the practice method and fighting method in Xing Yi are very different. For instance – in training, one should use the body to push the shoulder, the shoulder to push the elbow, and the elbow to push the hand, until one reaches a state in which the movement flows without interruption. Whilst in fighting, first one should crack the hand like a whip, then the elbow chases the hand, the shoulder chases the elbow, and the body chases the shoulder. When he arrived here (where? Not specified) he clapped his hands once loudly. He then said that fighting is the whipping of the body into the palm of the hand, just like one hand clapping the other. Taking Pi Quan as an example. In training, “Pi Quan is like pushing a mountain”. The body pushes slowly, section after section, from back to front; the more exhausting the exercise, the better – that is how gongfu is improved. Whilst in training fighting, Pi Quan is like swinging an axe. The mountaineers swing axes to chop wood just like a whip, with a sudden, clean whipping action. Otherwise, the head of the axe will jam into the wood and would not be able to cut the log in two with one strike. Li Cunyi’s students in Ninghe included Tang Weilu, Guo Zizhang, and another fellow that went through Ninghe often, whose name I cannot recall. This guy was a policeman who would walk around and catch criminals by himself. One time, a criminal grabbed his pistol from its sheath and was already holding it in his hand. One slap on his head, and the criminal was sent down to the floor, sitting there, confused. He remained confused for a few days, and must have suffered a concussion. 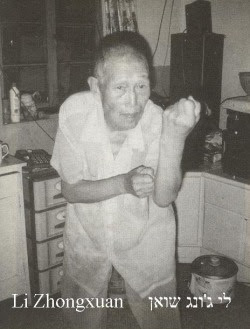 At another time, this gongfu uncle of mine was in Yantai, and hurt his hand while catching some criminal. In the hospital, they told him they’d have to amputate his thumb. Because he knew that Li Cunyi left his secret medical inscriptions to master Tang, he went and asked Tang for help. Master Tang made a recipe and sent me to give it to him. When I arrived in Yantai, I saw someone waving to me from afar. It turned out to be a student of this gongfu uncle. He told me he had recognized me at first glance: “We come from the same line, so we have the same gait”. The wound in my uncle’s palm slowly healed. In one of those times he was catching a criminal, he was shot to death. His fighting ability was of a high level. He might still have people who continue his tradition and Xing Yi. Shifu Bluestein conducts worldwide seminars, teaching Xing Yi Quan, Pigua Zhang, the weapons of these arts, Nei Gong, Qi Gong and more. You can arrange to study with him by reaching out through facebook or email at: jonathan.bluestein@gmail.com or Facebook.com/Bluestein . All the pictures and illustrations in this article, with the exception of the picture of Sun Lutang, belong to Nitzan Oren, and may not be used, copied or otherwise taken advantage of without his written consent. So interesting. Thank you for translating and sharing. It was very helpful that you also included the link to the first chapter. I appreciate your work and generosity.